#4 NORTH CAROLINA 69, N.C. STATE 67 – When 19,250 basketball fans settled into their seats in Phillips Arena in Atlanta for the ACC semifinal between #4 North Carolina and surging N.C. State, they anticipated a variety of plot lines that featured older and younger men with the names Williams, Gottfried, Leslie, Marshall, Howell, Zeller, Painter and Barnes. That said, as it turned out, the three men who were the center of attention were Ray Natili, Tim Nestor, Brian Dorsey – the officials. In a rough game that saw 42 personal fouls called, it took a bank shot from Kendall Marshall with 10.2 seconds remaining for the Tar Heels to pull out the victory. That play also attracted attention to the men in stripes when Alex Johnson, who was defending Marshall, either drew a charge (if you saw the play with red eyes) or committed a blocking foul (if you saw the play with sky blue eyes). Then with 1.2 seconds left, and Richard Howell thought he was fouled trying to get off a shot after getting his hand on a long pass. 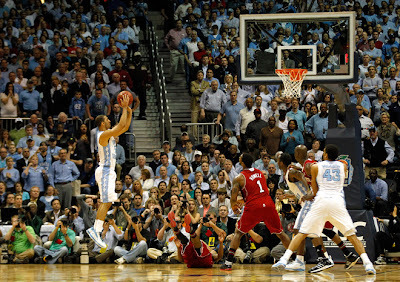 A review of the replay shows that two Tar Heels, along with Howell, also got a hand on that desperation heave. Howell, cleverly attempted a shot without really having possession of the ball trying to draw a foul. 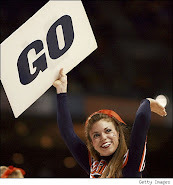 In spite of what various commentators said post-game, it has been our experience of over 40 years of watching ACC basketball games, that ACC officials rarely (if ever) make a foul call in the final minute of a close game. Today, was no different, but that didn’t make the first 39 minutes any easier to watch…or understand, for that matter. 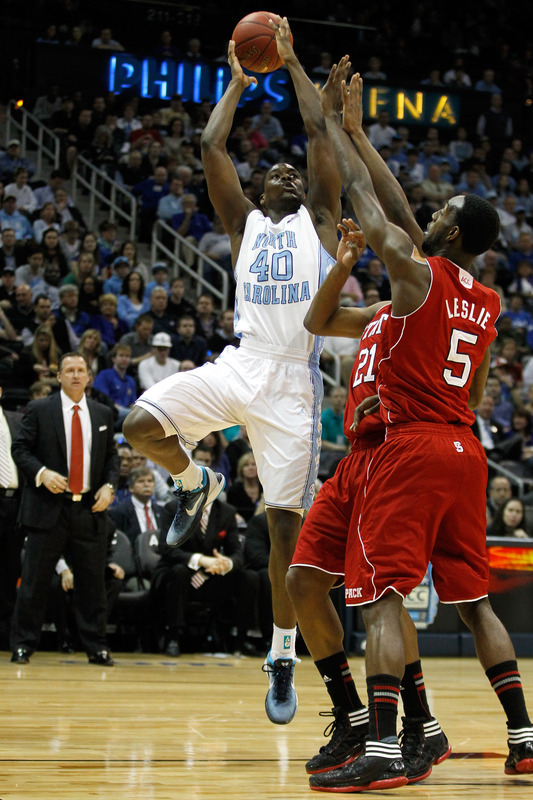 North Carolina averages 14.7 fouls per game and N.C. State averages 16.8 per game. 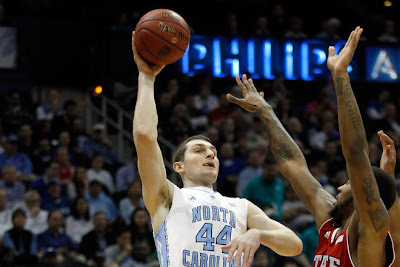 In the ACC semifinal, the Tar Heels were whistled 19 times and the Wolfpack 23. C.J. Leslie, who led the Wolfpack with 22 points, fouled out with more than eight minutes remaining. North Carolina (29-4) lost its top scorer when Tyler Zeller picked up his fifth late in the game after scoring 23 points. Both teams were in foul trouble for a good portion of the second half. N.C. State came to Atlanta figuring two wins would be enough to claim its first NCAA bid since 2006. The Wolfpack accomplished that goal, but it will still be a nerve-racking Sunday as they await the announcement of the 68-team field. Without John Henson who sat out the game due to a sprained wrist suffered against Maryland, North Carolina had trouble stopping N.C. State in the paint for most of the game. Lorenzo Brown scored 16 points and nearly bailed out the shorthanded Wolfpack. He split the defense for a rim-hanging dunk, then flew back toward the top of the lane, bounced off Barnes to draw the foul, rolled in a fallaway shot and sank the free throw to complete a three-point play that tied it at 66 with 1:31 to go. DeShawn Painter and Barnes traded free throws to set up the wild finish. Marshall, who had 12 points and 10 assists, dribbled near midcourt to let the shot clock wind down, then took off down the left side of the lane with Johnson trying to stay with him. The N.C. State guard planted his feet and thought he drew the charge, going down extra hard for effect. The officials didn’t buy it, and Marshall pulled up for the easy shot with no one in his face. The Wolfpack took off the other way, and Scott Wood tried to zip a quick pass underneath the basket to Howell. But Justin Watts stepped in to pick off the ball and just flung it high toward the other end of the court, hoping N.C. State wouldn’t catch up with it until the clock ran out. But Johnson got to it and wisely called time with 1.2 seconds left. N.C. State had a chance at a tying shot, flinging a long pass toward Howell with Barnes and Reggie Bullock in his face. Howell got a hand on it and turned to shoot, but the ball was flicked away and the horn sounded. 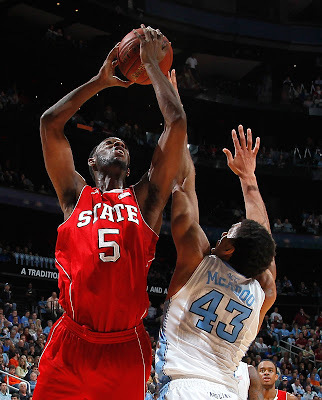 The Wolfpack went basket-for-basket with the regular-season champs in the first half. The lead changed hands 10 times, there were five ties and the margin was never more than five points either way. North Carolina coach Roy Williams wasn’t happy with his team, breaking his clipboard during a first-half timeout.